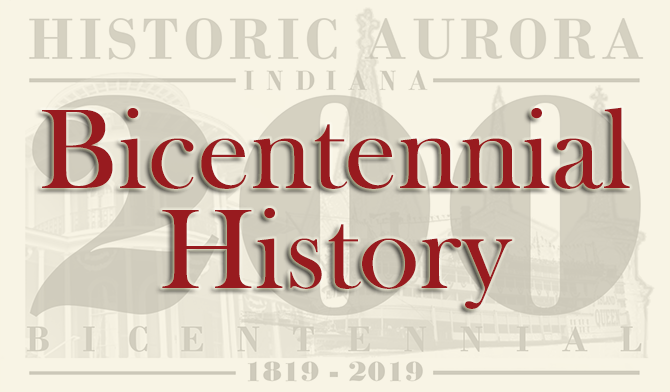 Folklore states that Jesse L. Holman, trustee for the "Aurora Association for Internal Improvements", changed the name of the proposed 1819 town from Decatur to Aurora because of jealousy with the thriving downriver community of Rising Sun. 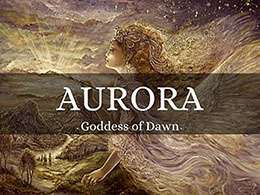 The rationale stated, "The Aurora (goddess of Dawn) comes before the Rising Sun." In Roman mythology, Aurora renews herself every morning and flies across the sky, announcing the arrival of the sun. 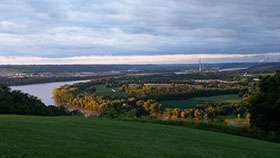 In 1810, Holman chose a spot atop a bluff rising 427 feet above the Ohio River and built a two-story cabin with a brick addition. The Holmans decided to name their new home Veraestau, from parts of three Latin words, ver (spring), aestas (summer), and autumnus (autumn). Holman hoped that there would be no winter in the new home as their arrival in Aurora was in the dead of winter with bitterly cold nights. 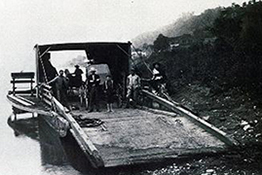 The Aurora Ferry was a system of several boats and tugs connecting Aurora to Kentucky for over 160 years. Even before Aurora’s incorporation in 1819, getting across the Ohio River was important to early settlers. In 1819 the Aurora Ferry was issued a franchise from Boone County, Kentucky. (Kentucky owns the Ohio River.) Early ferries were powered by horses walking on treadmills, and the first engine powered tug was the Etta Belle in 1918. Beginning in 1943, Charles Farrar began to operate the ferry. The C.J., owned and operated by Farrar, and later by his widow, Jessie Farrar, was the last ferry to ply the river full-time. Named in honor of the Farrars’ daughters Carol and Jane, the C.J. was operated until 1978 when the I-275 bridge was completed. A ferry was briefly operated again in the early 1990s when U.S. 50 was rebuilt between Aurora and Lawrenceburg. 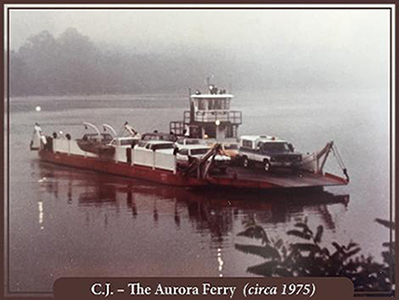 For many local citizens, the Aurora Ferry is an icon of times gone by. 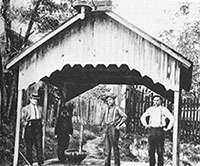 In 1888, near Hogan Creek, a mineral water spring was discovered when drilling for gas. An attractive small pavilion was built for spring as it was thought to have curative, healthy benefits. The water was enjoyed until the great flood of 1937 when it and the pavilion were lost. 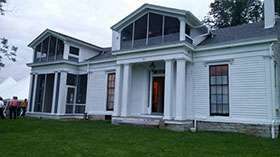 In 1966, the Aurora Chamber of Commerce and the Aurora Business and Professional Women’s Club restored the Blue Lick and built a new pavilion. The Aurora post office houses an example of New Deal artwork: a 1938 Section of Fine Arts mural by Henrik Martin Mayer, entitled “Down to the Ferry.” Mayer, an Indianapolis artist, cemented the oil painting to the lobby wall, May 28, 1938, above the postmaster's office door in the Aurora Post Office. The mural shows the Aurora skyline, including the old Southside School and the steeples of the Fifth Street Church, the Presbyterian Church and St. Mary's Church, from the Kentucky side of the river. Farmers with livestock and other travelers anxiously await the ferry boat to transport them across the river to Aurora. Post office murals were produced in the United States from 1934 - 1943, through commissions from the Procurement Division of the US Department of the Treasury. The principal objective was to secure artwork that met high artistic standards for public buildings, "where it was accessible to all people". The murals were intended to boost the morale of the American people suffering the effects of the Depression, by depicting uplifting subjects the people knew and loved. Murals produced through the Treasury Department's Section of Painting and Sculpture were funded as a part of the cost of the construction of new post offices. 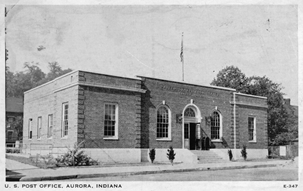 Aurora's new post office was opened in 1935. 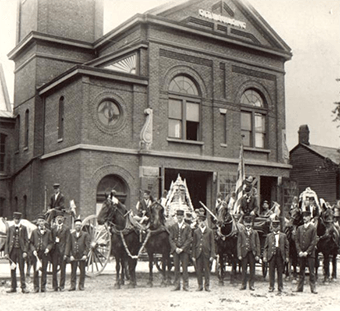 Aurora’s first steam fire engine was purchased in 1876, and was donated to the City of Aurora by Thomas Gaff, prominent businessman and founder of the Gaff Distillery. The “Thomas Gaff” worked many famous Aurora fires including Royer Wheel Works and once pumped for 72 straight hours during the Crescent Brewery Fire, thereby setting a world record for endurance. The “Thomas Gaff” was sold to a local junk dealer during a World War II scrap drive for $50.00. Its nameplate was given to Aurora Fire Company No. 1 by Earl Huffman, long-term fireman, who purchased it from Dolph Holler for $5.00. The steam pumper "Aurora" was purchased by the city on February 20, 1885 from the O & M Railroad Company for the sum of $3000.00. 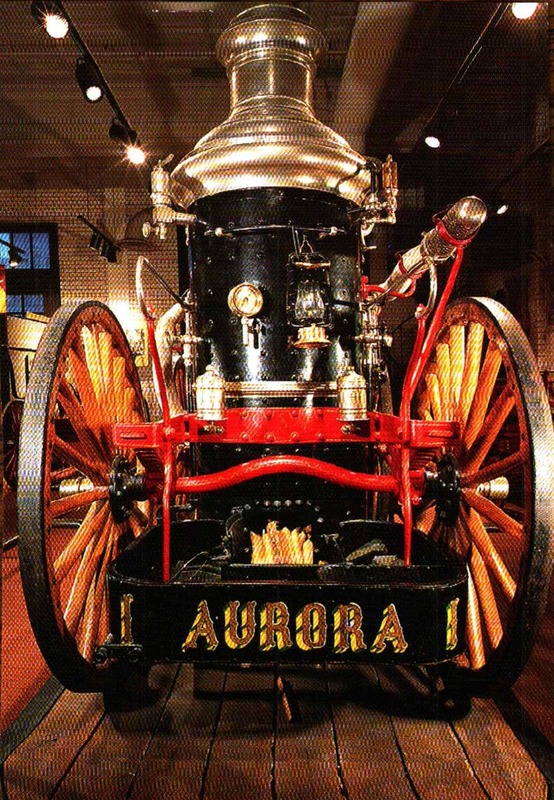 After a 3-2 city council resolution, the "Aurora" was loaned in 1962, to the Cincinnati Fire Museum Association for rebuilding and display in the Cincinnati Fire Museum. 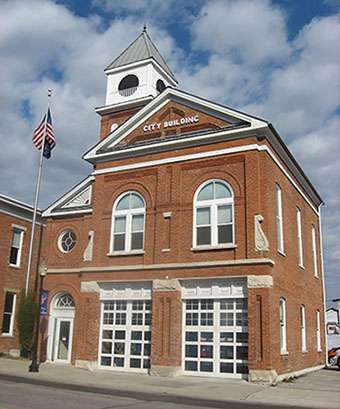 Under the terms of the agreement between the Fire Museum and the City, the City of Aurora retains ownership of the engine. 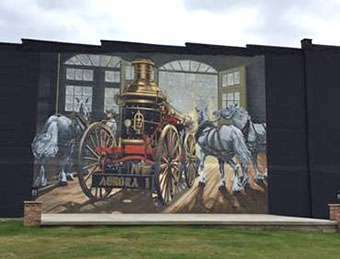 In 2017, Don Andrew commissioned Christian Dallas Art to paint a replica of the steam pumper "Aurora" on his building facing Gabbard Riverfront Park on Judiciary & Second Street. Andrew paid $11,000 towards the total cost of $16,000. 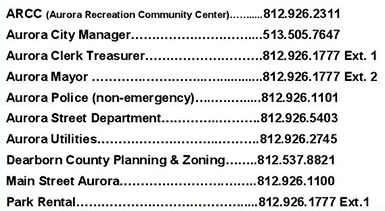 The rest was paid from the City of Aurora's 2017 Facade Improvement Grant funded through riverboat gaming. Built in 1886-1888, the City Building is part of the register-listed Downtown Aurora Historic District. Built into the original architectural design of the historic City Building, is an artistic rendering of the first light of dawn, “The Aurora” which can be seen from the Third Street side of the building directly to the left on the second floor. Entered into the National Register of Historic Places March 14, 1996, the building at 216 Third Street was built in the Italianate and Romanesque style and designed by Louisville, Kentucky architects McDonald Brothers & Louis Kreite. 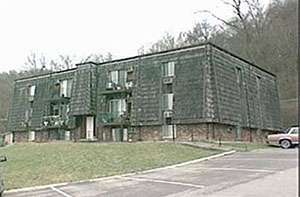 In 2004-2005, the building went through a major renovation which included an adjacent building and re-construction of yet another building at 233-237 Main Street. Today the building houses the Mayor, City Manager, Clerk Treasurer, City Attorney, the Aurora Police Department, Main Street Aurora, Purdue Extension Dearborn County, We Care Packages, an unoccupied jail, and Indiana’s longest continuously used city council chambers. Although the automobile was to have its greatest social and economic impact in the United States, it was initially perfected in Germany and France in the late 1800’s. Thirty American manufacturers produced 2,500 motor vehicles in 1899. 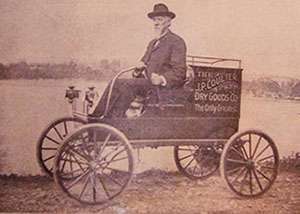 One of those vehicles, purchased by J.P. Coulter of Aurora, was the first automobile in Dearborn County. Coulter, born in Philadelphia May 29, 1835, came to Aurora around 1877 with the Ohio & Mississippi Railroad and given charge of the main road and branches at the Cochran Railroad Shops, 690 miles in all. 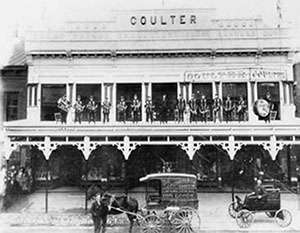 Coulter was an aggressive self-promoter and after leaving the railroad, founded The J.P Coulter Company, selling carpets, curtains and general dry goods. The building built in 1860, which Coulter moved into at 311 Second Street in 1895, boasted a decorative cast iron and pressed tin store front and an elaborate canopy. The Trustees of the new city set aside three lots 210, 222 and 288 for school purposes and the first school was held in a log cabin originally erected and later vacated by Mrs. Joanna Fox on Fifth St. 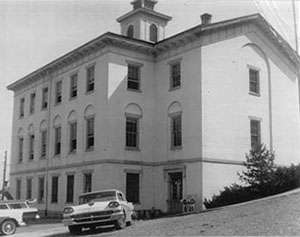 This school was of the first institutions incorporated in the State in 1826. The same year a Presbyterian minister, Rev. Lucius Alden of Boston, combined preaching and teaching and took charge of the Aurora Seminary and was the Superintendent of Schools for a salary of $300 per year. Assistant Stephen S. Harding received $13 per month for his services. Constructed on “Seminary Square” during 1859-1863 Southside School was opened in 1867. In 1867 the building was insured for $15,000 and the first janitor was hired to care for the school property. One of his many duties was to keep all hogs and cattle off the school playground. The first commencement exercises were held in the Methodist Episcopal Church in 1868 for three high school graduates; Lucy Stedman Hurst, Seth Stedman & Charles C. Stevens. 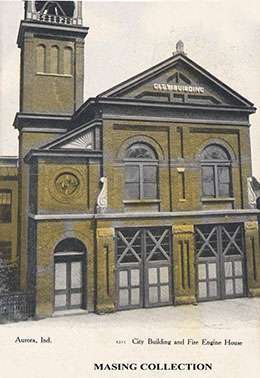 In 1879 the Commencement was held in the Opera House on Second St. which was then known as the “New Opera House”. Admission was 10 cents. 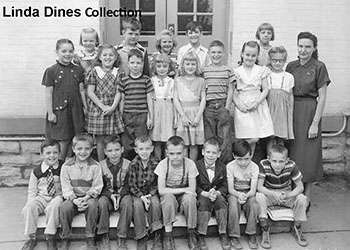 Southside School closed in 1962 and demolished in the early ‘70s to make room for the construction in 1972 of two apartment buildings now owned by Aurora Apartments Inc. at what is now 109-111 Dewers Street previously Seminary Lot Aurora Outlet 33.